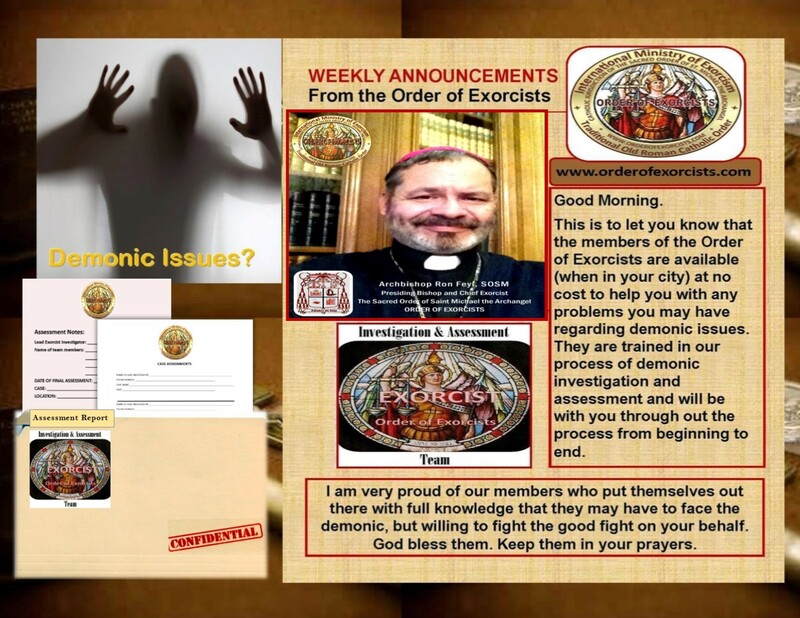 Our mission is to help anyone with demonic issues, free-of-charge, who are experiencing symptoms of demonic possession, demonic infestation and/or house disturbances, including evil spirits, demons, and demonic hauntings; the Order of Exorcists should be your last call for help. The Order of Exorcists is a group of professional specialists, trained in demonic investigation and case assessment. After the demonic investigation, if the case shows evidence of demonic activity, an appointed clergy exorcist will be assigned to the case to perform the rite of exorcism. Look for any sounds, visual effects, odors, or changes in room temperature. Our “Lead Exorcist Investigators, with team” will respect your confidentiality while providing a full investigative assessment analysis. At the time of our final analysis the Lead Exorcist Investigator will have a profile of the phenomena and contact the Order of Exorcists for elimination of any paranormal demonic entities, cold spots, and paranormal behavior, by house blessing and/or exorcism rituals. Our service is not just about confirming your paranormal phenomena, but, more importantly, it’s about terminating the problem, through exorcism, prayers, the use of holy water, holy oil, and salt along with other elements as required. Demonic possession of a household member.